Synergy with Overlord's Whip. Maybe this will see play in a more aggressive warrior deck after rotation. I've considered putting this in my n'zoth warrior just to have something proactive on 5 especially with the new fools bane comming up... Maybe not enough weapons in the deck but the effect is useful and stats are honestly solid. arena with paladin, truesilver champion = really good combo! If the enraged Smith dies (or is healed back to full) while Gorehowl is 2/1, it is reduced to a 0/1 but isn't destroyed. You can't attack anything with your 0/1 Gorehowl, but I'm assuming you can bring it back to life with another Smith, Upgrade! or Captain Greenskin. Not sure why this doesn't see more action in Rogue decks, this basically makes your hero power 'Equip a 3/2 weapon for 2". Being able to trigger it with Perdition's Blade makes it kind of useful at least. Do you have to be wielding a weapon BEFORE the enrage mechanic activates? Or will your weapon gain +2 dmg if you equip it after you let the Spiteful Smith take damage (assuming the Smith is still on the board). CONFIRMED: You CAN equip a weapon AFTER Spiteful Smith enrages, and receive +2 damage on the weapon. Also, if your weapon is still equipped when the Smith dies (most likely to happen while using weapons such as Gorehowl, Assassin's Blade, and especially Doomhammer), the weapon will lose the +2 along with the Smith. This whole time I always thought it was a guy. The Spiteful Smith makes a good companion card to the Bloodsail Raider. 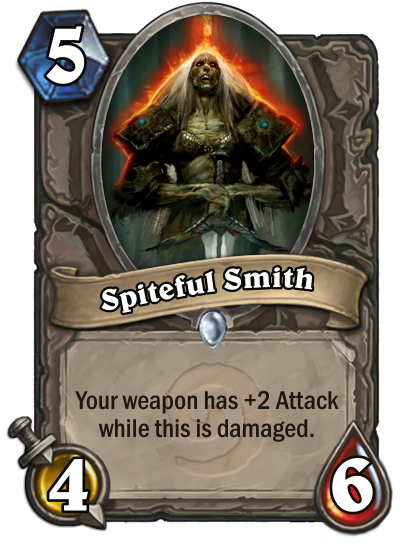 If you have enraged Spiteful Smith(s) out, your Bloodsail Raider will gain +2X Attack, plus any attack your weapon had originally. That way, your Bloodsail Raider can become a 6+/3 minion for only 2 mana crystals; nothing to sniff at! This card is also very useful for the Dread Corsair, though you will generally not be looking to decrease the cost of a Dread Corsair when you have weapons and a Spiteful Smith out to begin with anyway.